The 2014 Green Carnation Prize features a bumper crop of titles. 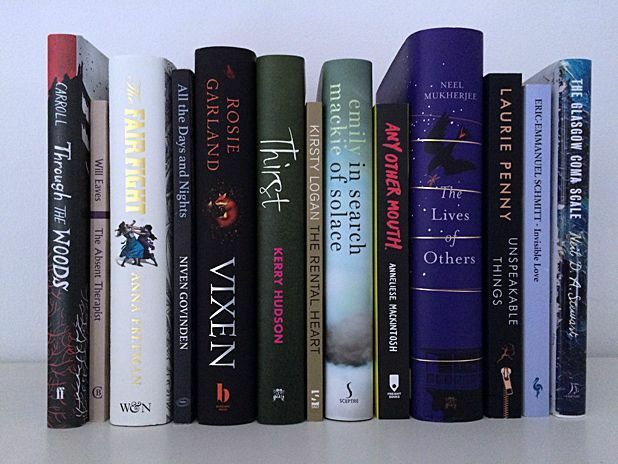 This award for LGBT writers has previously resulted in writers such as Catherine Hall and Andrew Solomon scooping the top prize, and this year the longlist is full of Scottish talent. Kirsty Logan, Emily Mackie, Kerry Hudson and Neil DA Stewart have all been longlisted, as has Anneliese Mackintosh whose collection Any Other Mouth was published by Scottish independent publisher Freight. Speaking as this year's chair of judges, I can say that the quality of submissions has been overwhelming. It's been fantastic to see so many Scottish authors longlisted, especially because it means I now get to reread them ahead of the shortlisting stage. The level of talent within the Scottish LGBT literary scene was clear from Freight's anthology, Out There, published last month and I'm delighted to see it represented here. It's also noteworthy for how many emerging authors made the cut. I mentioned in a review of Kirsty Logan's The Rental Heart for The Independent that we'll see her dominate longlists and shortlists in the next few years, and it's always nice to prove myself right. Equally, Kerry Hudson's second novel Thirst is a terrific follow-up to 2012's Tony Hogan Bought Me an Ice-Cream Float Before He Stole My Ma. I was fascinated by Emily Mackie's In Search of Solace when I reviewed it for The List earlier this year, and a second reading only convinced me further that she's one of our most talented young authors. Neil DA Stewart's The Glasgow Coma Scale is startlingly brilliant and is at the top of my reread list.